Today's post features the three latest collaboration shades from Picture Polish. I've had these swatches for a little while now and keep forgetting to share them with you. I've told you before how much I love the collaboration shades. I love reading about the inspiration behind them and seeing how each blogger comes up with some unique and different. Frosting by Cosmetic Cupcake. Frosting is a pastel milky pink creme full of silver, magenta and violet glitters, plus a little sprinkling of silver heart glitters. This is three coats with seche vite top coat and I did find that the silver hearts made the other glitters clump a little around them, so you will need to do a bit of jiggling action on those glitters. The finished mani looks delicious and sweet, just like frosting should. Sea Jewel by Waki Laki. Sea Jewel has the same finish as the Picture Polish mesh shades. That means it has a very dense fine glitter in a jelly base. 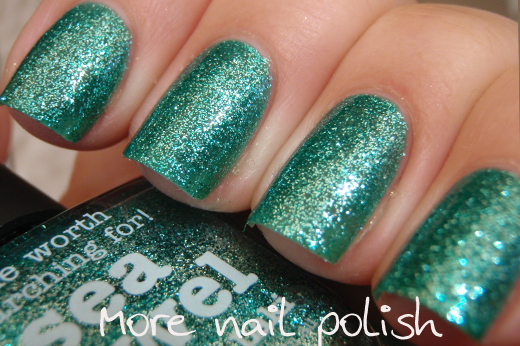 Sea Jewel has bright green and silver particles in a light teal green base. The glitter particles create a metallic looking shade but it is perfectly smooth. This would be one of my favourite mesh shades and I found the application much easier than some of the other mesh ones. 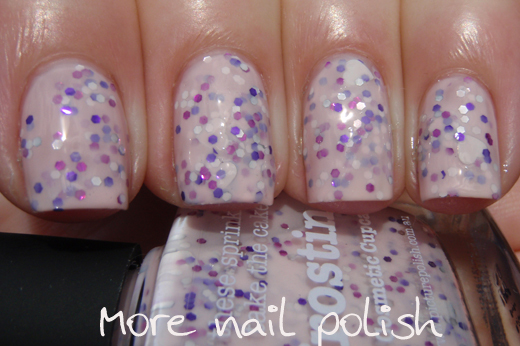 Because of the amount of find glitter in them they are usually very thick, but this one's formula was perfect. 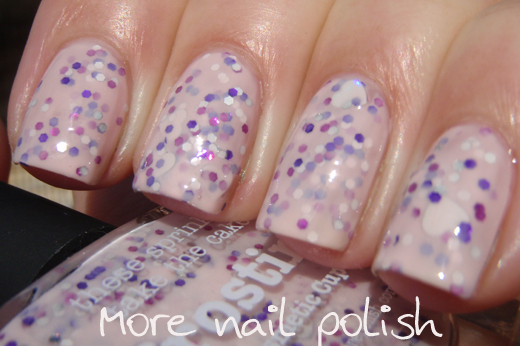 Whimsy by Neverland Nail Blog. 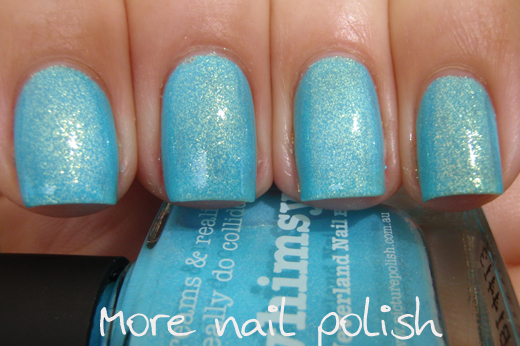 Whimsy is a light but bright blue with a rich gold glass flecked shimmer. This is totally unique in my collection, I can't think of any other blue polishes with a gold shimmer like this off the top of my head. This was two coats with Seche Vite top coat and the formula was excellent, although you will want to ensure you paint as cleanly as you can, cause clean up can be hard because those little glass flecks tend to really stick to your skin. I love that all these new collaboration shades have completely different finishes, and whist I love the Ozotic/Picture Polish scattered holo finish that is in a whole bunch of other collaboration shades, it's really great to see some polishes with different finishes. The new collaboration shades are available now from Picture Polish and their Network members. I love Sea Jewel too! I love this new collection of shades, the first two are my favorite, they are just so unique! This Nail Art Polish looks amazing. Going to have to try this out x.